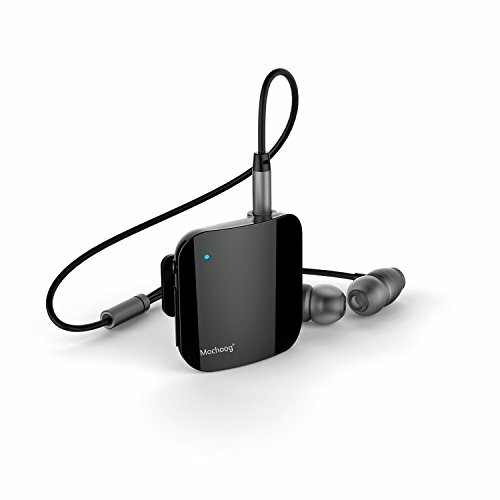 Bluetooth 4.1 Wireless Audio Receiver---- Match Your Smart Life! Mochoog 2 in 1 has a mini and protable body and is designed to convenient your life for which could be easily and quickly connect with your Bluetooth devices within 33 feet.If you are annoyed with the wired devices, Mochoog will save you from the mess and simplify. 3. Now you can enjoy your music through your headphone, speakers, home stereo system/car stereo system, or answer hands free calls. ! Long press button "+" and "-" simultaneously for 1 second, you could trigger the "voice assistant function" of your phone, and repeat the procedure to close. WIRELESS AUDIO RECEIVER & ADATER: Pair the device to your Bluetooth headphones/Speakers, and then plug it in your non-Bluetooth media devices (such as MP3, TVs, Car Bluetooth, etc.) via 3.5mm audio cable or RCA cable. MAGIC DUAL CONNECTIONS: This could connect two Bluetooth devices at once in both modes.And the short-cut button "Pairing Switch" provides you a more convenient way to connect the second Bluetooth device after you paired with the first. WIRELESS & SMART LIFE: When you watching TV and want to enjoy the Wonderful plot quietly or do not to bother your families,just connect the to your TV with 3.5mm audio cable/3.5mm audio adapter/RCA cables,and paired with your Bluetooth headsets. PERFECT CONTROL DESIGN: Designed with independent volume "+/-" button to have a perfect control of voice up/down & playing/pausing.And it also supports "voice assistant function"of your phone. If you have any questions about this product by Mochoog, contact us by completing and submitting the form below. If you are looking for a specif part number, please include it with your message.